What does it mean to be a 100 Best Green Workplace in 2017? As efforts to green the workplace go mainstream, our list showcases which organizations are going above and beyond the traditional concepts of sustainability — recycling, composting, energy conservation — to create environmentally sound enterprises. 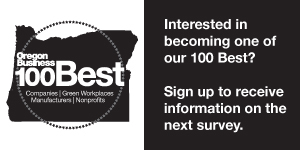 As the concept of what it means to be sustainable takes on new dimensions, our 100 Best Green Workplaces in Oregon project is a snapshot of how companies and nonprofits are thinking out of the box to foster meaningful, sustainable environments for their employees.